GK: If there’s something you can always count on with a KNT youth team, it’s the emergence of a hype GK. We saw the rise (and fall?) of Lee Changgeun, Lee Donjun, Song Bumkeun, and the list goes on – and now the big hype GK is Min Sungjoon who pulled off some amazing saves in the JS Cup vs. Morocco Mexico and Vietnam. DF: Recall that Kim Hyunwoo recently made a move to Dinamo Zagreb (and is actually getting some playing time). Hwang Taehyun was the backup RB in the 2015 FIFA U17 WC (where Lee Seungwoo and co. beat Brazil in the group stage), while the other defenders have been rotating on and off – KNT youth squads usually have a decent defense but not this one, the defense has been very disorganized in all their appearances (conceded every game, even against Vietnam, and conceded 4 vs. Mexico and vs. France). MF:If there’s something else you can count on about KNT youth teams it’s the emergency of a new attacking midfield, and in this generation the new star is Uhm Wonsang. The clear outfield MVP of the Suwon JS Cup, he displayed incredible pace in all three of the games and sparked a frenzy of “Uhm Wonsang ball touch” vids on Youtube. He was even singled out in praise by all three of the opposing coaches. Though it may be a little unfair to call him a breakout player – in the AFC U19 qualifiers he almost singlehandedly destroyed Indonesia (but it was Indonesia and no one really paid attention to those qualifiers). Otherwise, this MF is stacked – Kim Jungmin is a household name for us Korea fans esp after his heroics in the 2015 U17 WC and his instant impact at Liefering, but didn’t make the trip to France. This generation also boasts Jung Wooyoung, the winger for Bayern Munich II, who would’ve been called up had it not been for an injury a few months back. Lee Kangin, Cho Youngwook, and Jeon Sejin likewise need no introduction. The Dinamo Zagreb player Kim Gyuhyung had yet to make an appearance for the KNT, so many were eagerly anticipating his performances as well. FW: The only listed FW is Oh Sehun, who you may remember for scoring the winning goal against Ghana in the U17 WC group stage in the last minute (he was wearing the #20 jersey back then). He hasn’t really impressed in recent history, but he’s locked himself as the starting FW of this generation. My personal theoretical attacking lineup for this generation would be Uhm Wonsang – Cho YW – Jeon Sejin up top with a MF line of Lee Kangin – Kim Jungmin and (one of the two DMs here). And that’s even more OP on paper than the old U19 team of Kim Gunhee – Hwang Heechan Paik Seungho Seo Myungwon from back in the day, esp considering that Jeon and Cho are established K League goalscorers while Lee Kangin and Kim Jungmin are playing regularly in Europe already. Guess who else is playing regularly in a Europe youth team? Jung Wooyoung. Clearly, this generation has talent. This lineup was more or less what I expected – no surprises here. None of the players were making their U19 debuts. “It was a difficult game as [coach] Jung expected. The team lost convincingly, but the clear standout was Lee Kangin. Despite playing with teammates two years older than him he expressed his style of play and held his ground in attacking midfield against the physically much stronger French players. His ability to keep the ball and distribute it across the pitch was impressive. In the 18th minute he drew cheers from the crowd with a Marseille turn past two defenders and registered Korea’s first shot on target with a long range drive foricng a good save from the opposing keeper. Aside from Lee Kangin, I do think Uhm Wonsang showed his stuff in this game as well. That dude is ridiculously fast… and imo, should be starting every game for this team. The other players didn’t really have much time on the ball and I think the future games will be a better indication of how they’re doing. You can also see that our players were literally boys among men against France… their players are much bigger than ours to begin with, not to mention that this is an age group where every year actually makes a difference in terms of physical development. Even still, it’s interesting to see that our youngest player was the one who held his ground physically – Lee Seungwoo, had he been playing, probably would’ve fallen down looking for a foul on numerous occasions. Our lack of possession and ball retention in this game makes me think that Kim Jungmin actually would’ve made a big difference esp this game. We probably would’ve lost anyway, but we sorely missed his ball control today. Almost every year, France wins the Toulon Cup – it’s kind of a rite of passage for the young French players in Ligue 1. That being said, Togo and Scotland also brought their full U21 squads, and there is a very high chance we will get physically pushed around again in both of these matches. If there’s one thing this generation does very well it’s attacking prowess (this team scored at least 1 goal in all 8 games led by Jung Jaeyong). 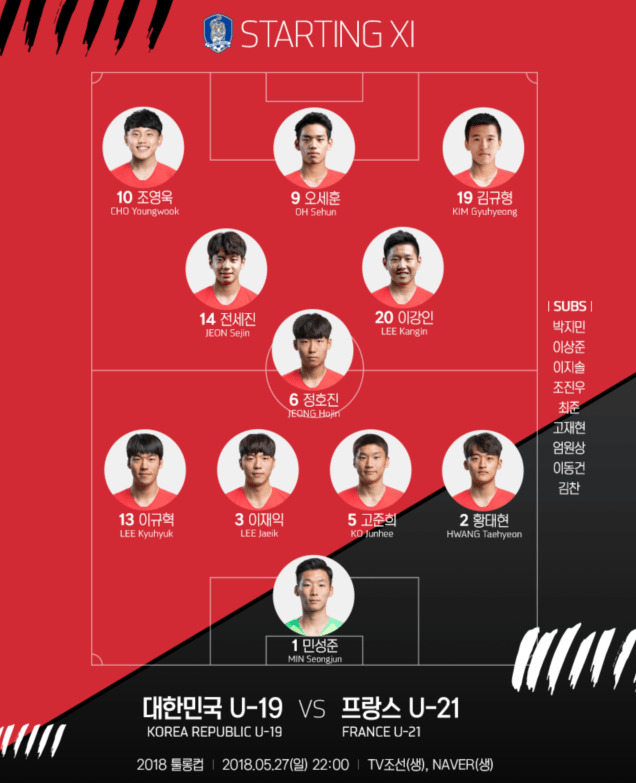 Cho Youngwook, Uhm Wonsang, and Jeon Sejin are the main goal threats in this team, and if we can play them into space (looking at LKI here), we should be capable of scoring a few against Togo and Scotland. How’s the coaching and strategy by Jung Jaeyong? I know very little of him as a person and coach and thus know nothing about his tactics. This is from Jinseok, he’s having some trouble posting a reply for some reason. “Ah crap I did it again, I always confuse Jung Jungyong the coach with Jung Jaeyong the footballer… thanks for the catch.